Papua New Guinea and Tahiti are looking to reignite recent form as OFC Stage 3 of 2018 FIFA World Cup RussiaTM Qualifying resumes on Thursday in Port Moresby. Tahiti lead Group B on goal difference after splitting their opening matches with Solomon Islands and could tighten their grip with victory away from home but face a Papua New Guinea side riding a national wave of football confidence. The home side built on their appearance in the final of the OFC Nations Cup by beating Malaysia in a friendly and under Danish coach Flemming Serittslev are enjoying their strongest showing internationally. Even with a number of key figures from that OFC Nations Cup campaign including former captain David Muta and striker Tommy Semmy unavailable for selection, a number of new and familiar faces have bolstered the Kapuls’ ranks. Netherlands-based former Auckland City midfielder David Browne is set for his first appearance in Papua New Guinea colours since playing for the U-17s as a 15-year-old in 2011 but Australian-based pair George Slefendorfas and former Central Coast Mariners defender Brad MacDonald are handy additions thanks to a loosening of the rules governing dual nationality in Papua New Guinea. Former New Zealand U-17 international Jamie Woodlock is also in the squad but is still awaiting FIFA clearance on his change in allegiance. “It has not been difficult to integrate them. They have done a lot themselves to be a part of the team and also the new so-called local players have been doing very well in our camp. For me it looks like a bright future for the PNG national team. Just as it was during the OFC Nations Cup, home advantage could once again be vital for Papua New Guinea as they look to regain ground on the other two teams in their pool. “I expect a very equal match like it was when we played during the Nations Cup. Tahiti has a very experienced team compared to our team which is very young now. For Tahiti, who won’t play on match days five and six, this FIFA window is their last chance to take a run at topping the group and making September’s final against the Group A winner. “For us it’s our last two games so we don’t have a choice. If we hope to qualify for the final of stage 3, we need a minimum of four points, but ideally six points from six – to win here and at home,” said Tahiti coach Ludovic Graugnard. Graugnard is also without a few players with AS Tefana players Jonathan and Lorenzo Tehau the most experienced of those but he remains confident in his squad to get the job done. “We have some new players in the group that weren’t there at the Nations Cup and PNG also have some new players. The match kicks off at Sir John Guise Stadium On Thursday at 4pm local time (8pm Wednesday TAHT). 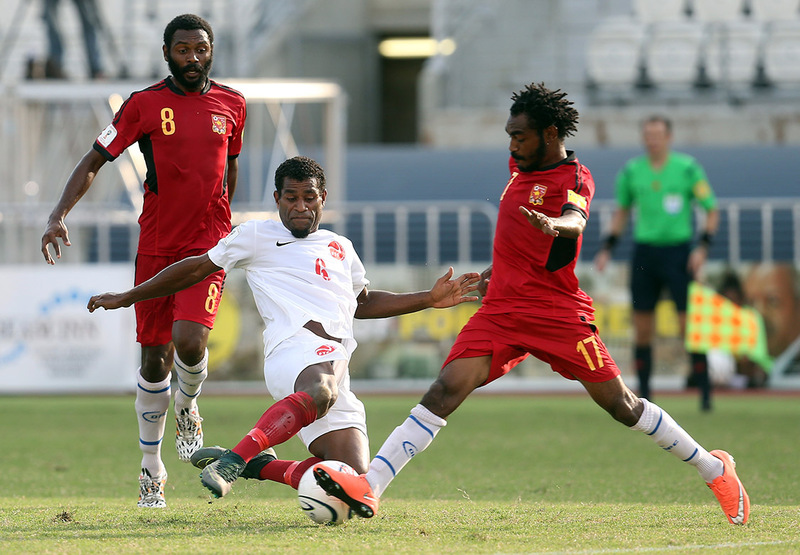 Vital Statistics: Papua New Guinea have never beaten Tahiti in a senior men’s international. The 2-2 draw at the OFC Nations Cup last year – their only FIFA World Cup qualifier clash to date – is one of 3 draws in a record that also includes 8 defeats. The Players: David Browne is an exciting talent once feared lost to Papua New Guinea football. He made a sole appearance for the nation’s U-17 team as a 15-year-old in 2011 before his career took off, first in New Zealand with Auckland City FC then more recently in the Netherlands with PEC Zwolle and FC Groningen but has finally found the national team’s call too hard to ignore. Papua New Guinea: 1. Kusuga KOMOLONG (GK), 2. Abel Lindsay REDENUT, 3. Richard ALOIS, 4. Alwin KOMOLONG, 5. Felix KOMOLONG, 6. Patrick AISA, 7. Raymond GUNEMBA, 8. Michael FOSTER, 9. Nigel DABINYABA, 10. David BROWNE, 11. George SLEFENDORFAS, 12. Samuel KINI, 13. Jamie WOODLOCK, 14. Emmanuel SIMON, 15. Philip STEVEN, 16. Giwi SIMON, 17. Jacob SABUA, 19. Clement WILLIS, 20. Brad McDONALD, 21. Ronald WARISAN (GK), 22. Donovan MURRAY, 23. Ila DAVID (GK). Vital Statistics: At the OFC Nations Cup last year, Tahiti finished level on points with both Papua New Guinea and Solomon Islands after all three teams drew and each beat Samoa but missed out on the semi-finals on goal difference. The Players: Midfielder Heimano Bourebare arrives in Port Moresby fresh from helping his club AS Tefana reach another OFC Champions League semi-final. The 27-year-old has already represented his nation at a FIFA U-20 World Cup and the FIFA Confederations Cup and that experience manifests as composure in front of Tahiti’s back four. Tahiti: 1. Mikaël ROCHE (GK), 3. Taumihau TIATIA, 4. Matatia PAAMA, 5. Matatia ROO, 6. Tunoa TEVAEARAI, 7. Marama AMAU, 8. Manuarii HAUATA, 9. Manarii PORLIER, 10. Teaonui TEHAU, 11. Sylvain GRAGLIA, 12. Mauarii TEHINA, 14. Jay WARREN, 15. Heimano BOUREBARE, 16. Moana PITO (GK), 17. Tamatoa TETAUIRA, 20. Alvin TEHAU.